Pop into any wine shop and scan the shelves. If the merchant sorts wines by grape variety, as many do, you'll likely see shelves full of Cabernet Sauvignon, Pinot Noir, Merlot and Syrah/Shiraz among the reds; Chardonnay, Sauvignon Blanc, Riesling and maybe Pinot Gris for the whites. Everything else probably clusters under "Other." Once we get past the "Big Eight" (or maybe even 10 or 12) grape varieties that make up the lion's share of the marketplace, the real fun begins. Around the world, more than 500 grape varieties are made into commercial wine, and that's not even counting the delicious blended wines that range from Bordeaux through Chianti to Chateauneuf-du-Pape, which with other Southern Rhone reds may carry up to 13 varieties in one delicious bottle. Today, though, I'm focused on a favorite single-varietal wine from Italy's other upper corner, Dolcetto from the Langhe hills of Piemonte in the Northwest. The Dolcetto region is centered on the villages of Alba and Asti, and smaller villages such as Dogliani, all of which may have their name appended to "Dolcetto" on the label of wines made from grapes grown within their boundaries. You'll occasionally run across a reference to Dolcetto as a light, fruity wine, and I've even seen it likened to Beaujolais. I don't see that at all in a wine that's built on dark fruit flavors with solid acidity and perceptible tannic astringency. I've long suspected that the confusion stems from the name of the grape, which translates loosely as "Little sweetie." But that's a vine-grower's moniker, not a wine-maker's. It refers to the sweet taste of the ripe, black Dolcetto grapes at harvest. Dolcetto's regional map overlaps the zones of the more sought-after (and pricey) Barolo and Barbaresco. With its neighbor Barbera, Dolcetto is favored by the savvy locals, who drink it up while those more age-worthy (and expensive) bigger brothers take their time to mature. While Barbera is usually sharply acidic, Dolcetto is relatively lower in acid but perceptibly tannic, an earthy flavor profile that shows best in company with food. And in its one aspect that does bear some comparison with Beaujolais, Dolcetto - in spite of its tannins - is best drunk up within a few years of harvest, before the fruit fades and leaves the astringent tannins on their own. Want to know more about Dolcetto and locate vendors who have good ones? This fact sheet on Wine-Searcher.com offers information about Dolcetto, followed by links to 282 specific bottlings and retail sources. Save up to 60% plus get $1 Shipping on Award-Winning California Wines! The California Wine Club's $1 Shipping Spring Wine Sale is going on now. Stock up and save on award-winning, limited-production artisan California wines priced as low as $9.99. Shop Now! •	Award-winning, limited-production wines from California’s best “mom & pop” wineries. These wines typically cannot be found outside their wineries. •	Limited-production wines from small artisan wineries around the world that have been imported directly by CWC and cannot be found anywhere else in the U.S.
•	Premium Napa Valley Cabernets aged 8-12 years under stringent, temperature-controlled conditions. •	Collectors and Connoisseurs: stock up on California's most coveted 90+ rated wines. To shop now, click here or call 1-800-777-4443. FOOD MATCH: Dolcetto is an easy match with red meats, roast poultry and sturdy Northern Italian cheeses. Roasted veggies also work very well. It was spectacular with a winter dinner of fennel, onions, potatoes and carrots, cut in chunks, tossed in olive oil with salt and pepper, and roasted at high heat until the veggies were tender and their surfaces caramelized golden brown. WHEN TO DRINK: Although the tannins suggest some cellar-worthiness, it's my experience that Dolcetto doesn't evolve well with cellaring. Its fruit character, best when the wine is young and fresh, doesn't usually gain with cellar time. It should be safe to keep it through 2014, but in general, it's a good practice to drink up your Dolcetto and then buy the new vintage. VALUE: My local price is right on the median retail tag reported by Wine-Searcher.com, an appropriate price point for a table wine of this quality. Mauro Veglio = "Mau-roe Vehl'yo"
The Mauro Veglio Web page is available in Italian and English. Here's an English-language fact sheet on the Dolcetto d'Alba. 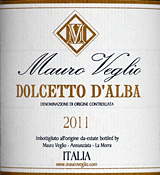 Locate vendors and compare prices for Mario Veglio Dolcetto d'Alba on Wine-Searcher.com.